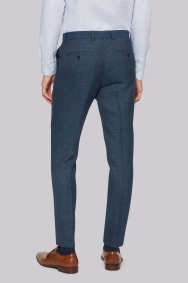 This Moss London suit comes in a Skinny Fit cut, and has a wool blend Bright Blue Textured fabric. Good fit. Nice texture. Excellent feel. Would have loved for it to be a bit more tapered and marginally shorter in the leg, but these are specific to me and for an off the rack fit, it is still very good. Material also quite thin, but good enough for price. Excellent material. Sizes are definitely slimmer than you may expect. 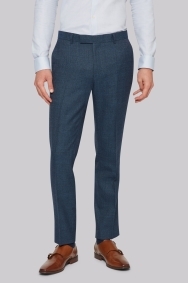 Go one size up for suits and pants from what you would normally buy. Product was as expected and packaged impressively. Fantastic service throughout. The staff were friendly and willing to out of their way to help.